Kids will love practicing the alphabet and learning letter sounds with these super cute, Funny Faces Alphabet Coloring Pages perfect for Toddler, Preschool, and Kindergarten age kids. Kids need lots of practice identifying letter sounds in words. 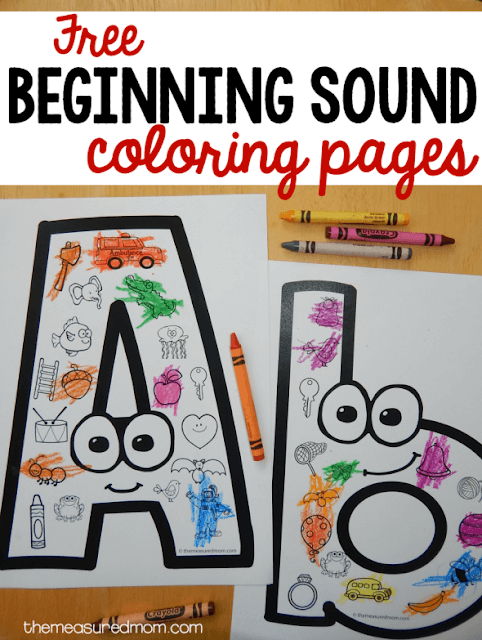 These super cute [and FREE] Beginning Sounds Coloring Pages from The Measured Mom are so cute. I love the cute faces! These are great for toddler, preschool, and kindergarten age kids.